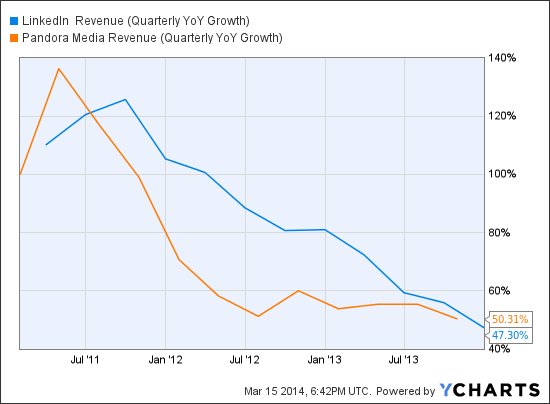 Again, the trend looks terrible for LNKD and I generally stay away from companies that have such numbers. I am a believer in LNKD though and do think they will turn this around. I’ve been a long time believer in LNKD but have never been able to make it a long term holding because the valuation never made sense. It has come down mostly on growth concerns but not enough for me to buy outright. I do like to buy it on a long & short basis though because I do think that LNKD has done a good job of diversifying its revenue sources and that some of the concerns have been overblown. It makes little sense for example to look at y/y traffic to its website (which has been declining) without considering use of its mobile apps in a world where everything is moving towards mobile. I do think that LNKD is a no-brainer when I compare it to a stock such as CRM which is trading at a comparable valuation. Needless to say that things are not going in the right direction. They’ll eventually turn things around I believe but until there are clear signs that it will happen, I can’t imagine buying CRM at its 80 forward P/E. On this morning’s opening, I will be closing out one of the current live trades that is beyond +20%. 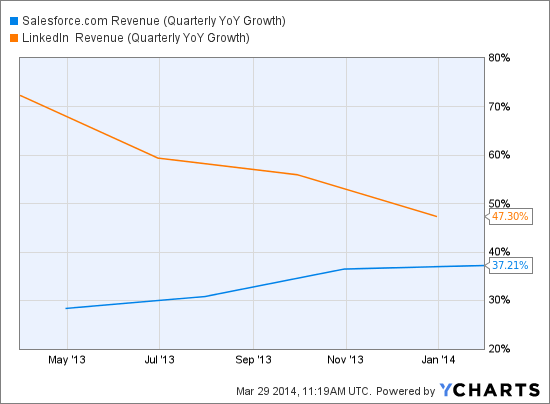 No, it’s not Apple (AAPL) vs Rackspace (RAX). I am comfortable with that one. Rather, I’ll be closing out Long LinkedIn (LNKD) & Short Pandora (P) which is slightly better than +20% at the moment. It’s been fascinating to see the Ukraine crisis develop and I have been closely tracking the RSX etf that tracks the Russian market. It just feels like the downside is fairly small at this point… or is just me? You’ve likely seen news regarding 2 tech IPO’s this week. Yesterday morning, I added a new stock to the list of tech stocks that I follow. King Digital Entertainment (KING) turned public. You might have never heard about this company. In fact, it is a gaming company that has published “Candycrush Saga”, perhaps the most popular mobile game these days. In both cases, the company has one hit game, with revenues based mostly on virtual goods purchases by users. When you look at competitors such as Blizzard, it’s difficult to not consider King’s significant risk when CandyCrush does eventually lose some of its popularity. I often talk about “lock-in” as a significant factor in evaluating the future value of a company and I just don’t see anything that gives me confidence in KING’s “next big” games. Would I buy KING? I doubt it. There is certainly a chance that the stock is cheap but I’ll have to see strong evidence that it can sustain success in its future games. I’m willing to risk losing out on an opportunity. On the surface, Box and Dropbox are two incredibly promising companies. They are both involved in the online storage business which is seeing very strong growth. Box already has 25 million users and 225,000 businesses using its services. One great thing about this business is the fact that its a booming industry and customer retention is high. The less optimistic view of course is the competition. Box can probably do well competing with pure storage competitors such as Dropbox and Evernote. Its problem is when trying to compete with Amazon, Google Drive, Microsoft OneDrive, etc. These are huge players that have an “ecosystem strategy”. They don’t need to make much profit on storage because it’s mostly about integration with everything else that they do. Some even argue that they are willing to lose money on storage for several years in the hopes of gaining a solid customer base. Not only will that make it challenging for pure storage plays but it will also drive margins to the ground. Once again, I find it difficult to get excited about Box’s IPO. The same will likely be the case when Dropbox comes out. Since the pricing is not out yet, I can’t say how expensive or not BOX will end up being but there does seem to be a lot more talk about potential that what I personally expect so I doubt I’ll be a buyer on either one. Time will tell though. Would you invest in either of these stocks? That being said, being a millionaire clearly does not mean what it used to, especially in this era of ultra-low interest rates. Someone earning 4% on $1,000,000 (which would be fairly good) would only generate $40,000 before taxes. And that is for a portfolio of 100K. It’s unlikely that someone with a net worth of $1M would have all of his money in the market. The reason I post this monthly update is both to keep myself accountable but also have a more public discussion about my plans and how I can become financially independent as quickly as possible. For example, if my base salary is currently 100K, my objective is to make 100K of passive income on an annual basis. This could be done through a variety of methods which I will be exploring of course. A few people tried to figure out how much capital I have by looking at the USDP size. The main issue is that the USDP is only part of my dividend income. I also get income from my ETF holdings, etc. My primary objective remains to generate 100K in passive income on an annual basis as soon as possible, ideally from a few different sources. I am aiming for an income of 100K or so, before taxes as a first goal. To be clear, I feel like I need significantly less than that. Why? I’ve described how I am living off of significantly less right now (I’m paying taxes, paying my house, saving, etc). I also have the option, as discussed of retiring in a foreign location. I discussed the idea of needing 100K in yearly income here. I’m a strong believer in working with clear objectives but also holding myself accountable so writing about these objectives will without any doubt help me reach financial independence more quickly. 7.70% – Dividend/Investing Portfolio: Not much to report here but the expected dividend income did increase slightly, always a good sign. 8.08% – Private Investment In My Online Company: No changes here although I did meet my biz partner and we do expect to raise our kickbacks later this year which will hopefully make a decent difference. 0% – Real Estate: I have started writing about adding real estate to my income flows. One aspect that I love about Real Estate Investing is how much of an inflation hedge it will represent for my portfolio. So I started looking into some aspects such as investing into residential or commercial real estate as well as the question of becoming (or not) a landlord. I’ve also looked into the possibility of renting property that I’d own though AirBnB (and an updated post here) and a few other questions I had been wondering about. 0% – Other ideas – I could end up starting other businesses or projects will I’ll certainly keep you posted about. –Pensions: I do know that the government will be paying me a sum of money once I retire. However, given how poor government finances look like these days, I personally think it’s crazy to count on the government actually fulfilling its promises. It won’t happen. Yes, there will be money, but not anywhere what is currently being promised. Whatever I do end up getting will be a nice surprise. –I feel like I am being extremely conservative here. By not including my government pension and also not including the fact that lower revenues will mean less taxes to be paid, I’m overestimating the amount of passive income that is truly needed. That is more than fine by me. I’d also like to think that my house will be paid by then making my level of spending lower all things being equal. It’s easy to look at a chart like this and think that I’m still so far away from my goal but I’m getting there, step by step. Do you have any questions or comments? I’d love to hear any ideas or how you’ve been managing on your end as well! IAC Interactive had quite a climb in the past 2 years but it does look like the days of high growth are over for now! It’s somewhat ironic that a couple of weeks after closing a trade on eBay based partly on events that are still going on, I’m back at it. The truth is that with 6 live trades, I didn’t have as many options and while I do think there is a bit more downside on EBAY at the moment given the Carl Icahn involvement, there is also significant upside and when I was looking for the best trade options, going long EBAY was an attractive option. I continue to think eBay should be valued as a bank and that Paypal is a gem. I also think it will eventually lose much of its dominance as the competition is clearly aiming at much better products. Will that happen anytime soon? I personally don’t think so no. The payments space is incredibly attractive, features startups (Stripe, Box) but also web giants (Amazon, Google, etc) and traditional players (Mastercard, Visa, Amex, major banks, etc). It’s also a lot more complex and difficult than most of us could imagine and Paypal does have significant lock-in effect. I’ve been impressed overall by the performance of IAC in the last few quarters and they have been posting solid progress both in terms of fundamentals and stock price performance. That being said, I think the comeback was expected after a fairly severe setback following the 2008-09 financial crisis for IACI. The fact is that there is very little excitement coming out of its products or properties and I don’t expect IACI to keep up with a company such as eBay that has a fast growing payments site. You might have heard about data-driven journalism? Nate Silver is probably the best known example and I’m loving what him and his team have going at FiveThirtEight so far! It has its critics of course but that’s generally a good sign. You an read more about it here. The other more interesting thing that happens is that private companies do end up going public in periods like this one. There are several possible IPO’s coming this year that will likely appear in the stocks that I follow. I do generally stay away from trading them in the first few weeks/months because of the incredible level of volatility but I know that I’ll likely be trading these names. IPO within a few months? –Alibaba: The ecommerce giant is set to become one of the largest IPO’s ever with the company being valued at approx $150B. Another very interesting aspect is that Yahoo holds 24% of Alibaba. Given that Yahoo is worth around $38B, you can see that almost 100% of Yahoo’s value is based off of its Alibaba holding. It will be very interesting to see how that whole story will pan out. –Weibo: Interesting note is that Alibaba owns 18% of Weibo… You might have never heard about this Chinese social web company that describes itself as an alternative to Facebook and Twitter in China. It has 241 million users, almost entirely based in China. –Dropbox and Box: Both companies are in the cloud storage area and have been looking at an IPO for some time now. They probably should have gone ahead a few months ago. Last week, Google’s surprise announcement to dramatically improve its cloud hosing prices is a major blow to Dropbox and a reminder that they will have a very difficult time competing in a low margin space (cloud hosting) with rivals such as Google, Amazon and Microsoft ready to battle and perhaps even lose money to keep market share. Already, Dropbox users have been very vocal on social networks asking for prices to improve dramatically. Box does have a stronger enterprise client base which will help but I would personally also be very careful about evaluating its long term prospects. Both are looking to turn public as soon as possible. In September 2011, I did some in-depth research to find long term sustainable dividend stocks and have been doing updates on this Ultimate Sustainable dividend portfolio since then in the attempt to show how well such a portfolio can perform over the long term. I would personally say that things have been going very well and will certainly continue to evolve. I do have a few more things planned which I will discuss in the near future. The USDP is obviously a critical part of my now very public quest to replace my job income with passive income. you can see my most recent update here. Keep in mind that this portfolio was built by selecting 20 stocks out of thousands. The goal is not to pick the best dividend stocks but rather to pick a diversified, high quality portfolio that will keep dividends increasing over time. Great month of income as the portfolio will end up generating $138 of dividends, a 75% increase over the same period last year! I LOVE seeing such progress!! This time around, I am not entering any new trades apart from re-investing the dividends that were received. I will be doing an in-depth review of the stocks within the next week which will surely lead to 1-2 trades at a minimum. This is my 9th long & short trade of the year and with an average return of 8%, I’m very happy with the results so far. I do still have one trade above +20% that could be closed soon (TRIP/ADBE) but I do like being long TRIP at this point so I’ll let it go a bit longer. 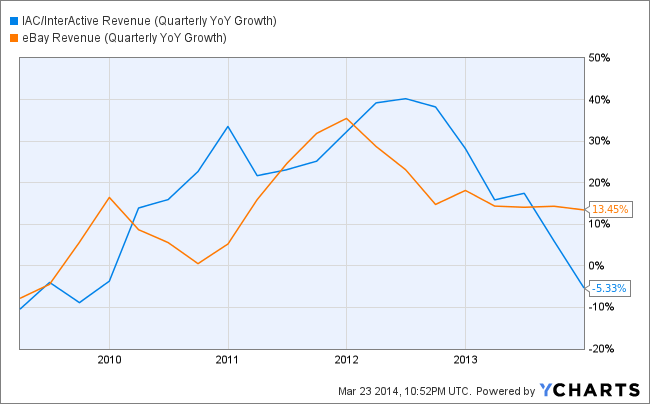 Wow… talk about slowing growth for both companies. LinkedIn is slightly better but both have discouraging trends when you consider their P/E’s. LinkedIn is a company that I’ve discussed several times and have been a big believer in. I have always had an issue with their valuation though and while it is coming down a bit, it still seems expensive to me. In the context of this trade though, it’s a perfect match to contrast two companies that are trading at virtually identical forward P/E’s. I do think LinkedIn will continue to show strong growth as it’s been able to diversify its audience but also has many different revenue sources and a corporate (and fairly wealthy) client base. -Pandora very much depends on different ecosystems such as Apple’s iOS and Android devices. It’s not meaningful (yet) that Pandora seems to be excluded from the upcoming CarPlay but it’s certainly cause for worry. –It is simply too competitive: While some are slightly different products, Pandora does compete with the likes of Apple (iTunes and iRadio), Google, Amazon, Spotify, etc. Even if Pandora does end up having the best overall product, it will have less negotiation power both with consumers and artists/labels which will continue to squeeze Pandora’s bottom line. So no, clearly I do not believe Pandora is worth its current forward P/E of 70 or so….